A capsule endoscopy examination is a procedure to see inside the small bowel. The capsule examination is utilized for purposes such as detecting bleeding, ulcers, or inflammatory bowel disease. The procedure is painless and allows a video capture of the entire small bowel. The Capsule Endoscopy or PillCam, allows your Frisco,TX Gastroenterologist to see the portion of the intestine where the endoscopy or colonoscopy can’t reach. The capsule itself is a small pill that has its own light source and takes a video of your small intestine as it passes through. While the video capsule travels through your body, it sends images to a data recorder you will wear close to your waist. Afterwards, your doctor will view the images on a video monitor. Capsule examination helps us to evaluate the small intestine, which cannot be reached with either endoscopy or colonoscopy. The most common reason for doing a capsule endoscopy is to search for a possible source of blood loss. Anyone with anemia (low blood count) and no source found on other examinations will need a capsule. It is also useful for detecting polyps, Crohn’s Disease, Celiac disease, ulcers and tumors of the small intestine. Kenneth Brown, M.D. uses the Given Imaging PillCam SB video capsule when performing Capsule Endoscopy procedures. 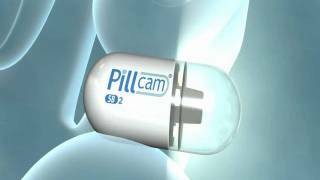 To learn more about how the Given Imaging PillCam SB works watch the video on the right side of the page or visit their website. How should I prepare for a Capsule Endoscopy? You will receive Capsule Endoscopy preparation instructions prior to scheduling the procedure. An empty stomach allows optimal viewing conditions, so you should start a liquid diet after lunch the day prior to the examination. What can I expect during the Capsule Endoscopy? You will arrive around 8 a.m. at our Plano Clinic and ingest the capsule (which is the size of a large vitamin) which passes naturally through your digestive tract while transmitting video images to a data recorder. At the end of the procedure, the data recorder will be removed and images acquired during your exam will then be downloaded for Dr. Brown to review. This procedure is painless, and should not cause the patient any discomfort. After ingesting the capsule and until it is excreted you should not be near an MRI device or schedule an MRI examination. Although complications can occur, they are rare when doctors who are specially trained and experienced in this procedure perform the test. Dr. Brown is board certified and has successfully performed this procedure on hundreds of patients in the Dallas TX and Plano areas. However, there is potential for the capsule to be stuck at a narrowed spot in the digestive tract resulting in bowel obstruction. This usually relates to a stricture (narrowing) of the digestive tract from inflammation, prior surgery, or tumor. It’s important to recognize obstruction early and make Dr. Brown or his staff aware of it immediately. Possible symptoms of this obstruction include pain, unusual bloating, and nausea or vomiting. Be careful not to prematurely disconnect the system as this may result in loss of video images being sent to your recording device. How will I know the results of the procedure? Dr. Brown will process the information from the data recorder and will view the pictures taken by the capsule. After the he has looked at this video, you will be contacted with the results.